Ordered: Grilled Cheese w/ black truffle and Spicy Zucchini Chips. Thoughts: I'm going to be honest: I purposely avoided Local 1205 for quite a long time. There's just a real hipster, AK, unwelcoming vibe to the place that really kept me at bay. But a few weeks ago I happened to glance their sandwich menu online and the beacons of an Albacore Banh Mi and Lobster Reuben wrangled me through the front door. Unfortunately, it was a Monday, thus a Meatless Monday. No Banh Mi, Reuben or Porchetta for me today. I went with the Grilled Cheese w/ black truffle instead and I really can't complain. Although rather rich and decadent for an afternoon sandwich (especially on a hot June day), it truly is a stellar grilled cheese. They take two slices of sourdough and fill it with aged Gruyere and fresh Laura Chenel goat cheese and a truffle butter with chopped black truffles from Molise, Italy. Black. Truffles. In. A. Grilled. Cheese. After a trip to the panini press, they toss in a little fresh arugula greenery. Boom, the 1205 Grilled Cheese. All in all, a great MM option. 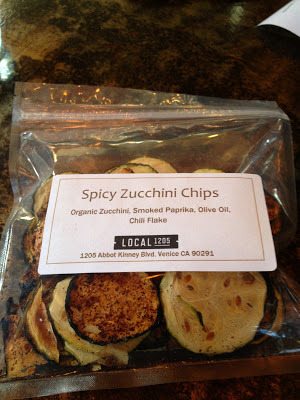 Local 1205 also offers homemade "Spicy Zucchini Chips," which were solid, but pretty much thin zucchini slices with some paprika and chili seasoning then thrown in the oven for a while. That said, they're nice alternative to potato chips. Did I Miss Meat? : Not especially.